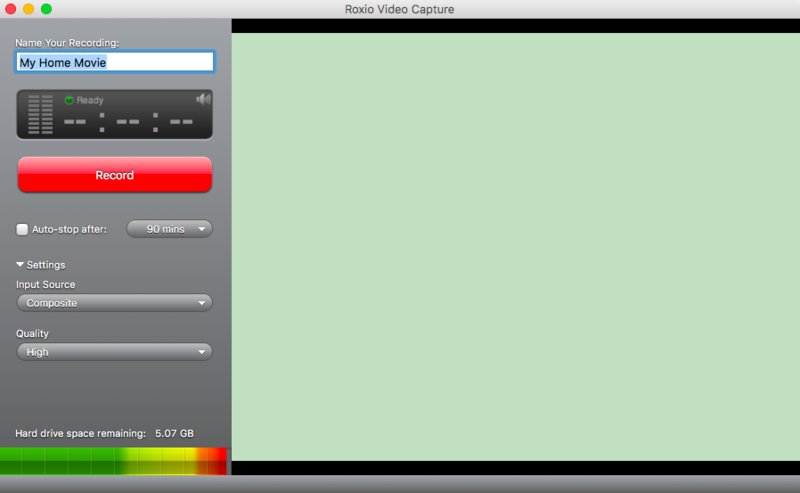 I have Roxio Video Capture Version 3.1.0 (141) and I'm using it with a Mac - I've tried on MacOS 10.12.5 as well as MacOS 10.11.6 just in case the newer OS broke something with the Roxio software. I'm attempting to capture video from a VCR over composite cables. I have tried with other sources as well with no success. The preview screen always shows a green screen. I've never seen video come through. The audio comes through for 1 second when the screen capture hardware is first plugged in, then goes silent. If I play with the volume in the sound preferences, sound is then audible (see the attached video clip of the screen during recording). The video file saves as an .mov file, but appears to be only an audio track, although there is no sound on that track. Does anyone have any suggestions on how to make this work? Is this the software that goes with the USB device? The description makes it look like it came from at least the Toast 11 era, i.e. before 2014. The latest listed software update for the similar Easy VHS to DVD Capture is v1.0.5 from 2011. If so, I’m surprised you got it to launch even. Perhaps it needs a Mac OS X version from longer ago? If it is newer, or even current, then I wonder why the Roxio site has no mention of it. If you search this subforum, then you’ll see that more people have had similar issues. Some suggestions were offered (e.g. order of launching software and plugging cables), which may or may not apply to your situation. Easy Vhs To Dvd For Mac: Capture Problem!